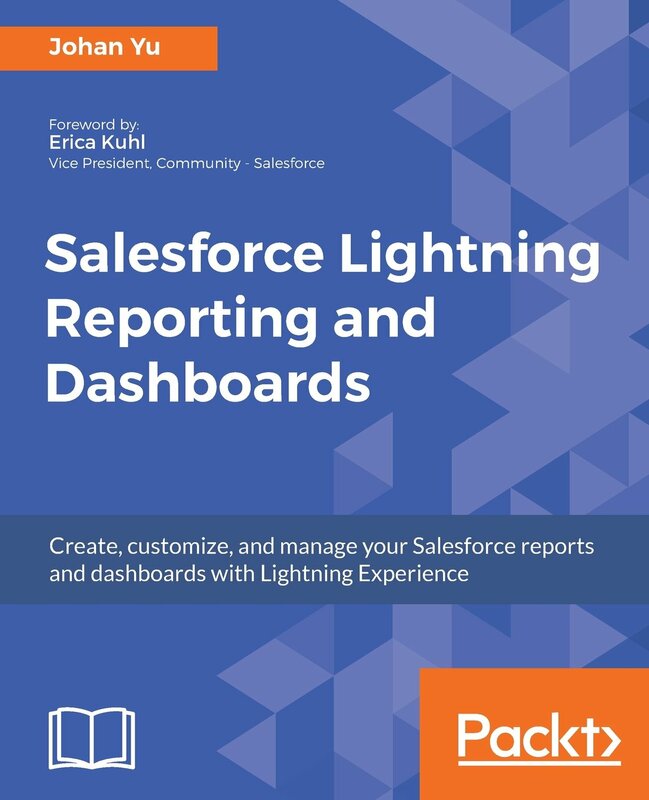 Can we set Salesforce.com standard field to be unique? Salesforce.com administrators and consultants often get business requirement to set standard Salesforce.com fields to be unique. In some companies, we need to make sure every mobile phone in Contacts have to be unique (if it is not blank). 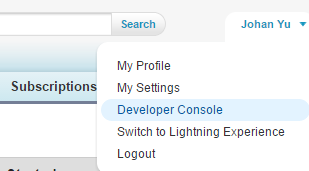 And as we known, until now, we are not able to set standard Salesforce.com field be unique, only custom field have this option. So, any solution? Yes, there are few ways to get this done, from a simple one until a difficult one. Using trigger may be not a simple way, we need a developer who well understand Salesforce Apex Trigger. Developer need to write apex code in Developer instance or Sandbox instance, make sure the test method coverage above 75% and deploy it to production. Developer may be like this approach, although it is not something prefer by administrator. Trigger in Contact before insert and before update, query all Contact with mobile phone enter, if query result is > 0, add error and don't allow to save or update that Contact. Instead of using standard Salesforce.com standard field, using the same sample as above, we can build a new Mobile Phone field with field type = Phone. And hide standard Mobile Phone field from Field-Level Security (Prefer not just hide from Page Layout). But, if this is an enhancement, it would be more effort to extract existing data to external file, verify there is no duplicate value and import the data back to the new fields. This even become worst, if the standard field has been used in many places, such as: reports, apex code, workflow, etc. This is prefer option with less effort. Create a new custom field and enable Unique option then hide it from page layout. Create a workflow with criteria ISNEW() || ISCHANGED(MobilePhone). Create immediate workflow action to update the new field above. This option may be more simple, but the error message shown is not clear as it is not say what field is duplicate, but just inform it is duplicate with which record, example: "Duplicate value on record: John Wood". User do not know exactly what is duplicate between Contact working on with John Wood, if we have more than 1 field need to be set unique. 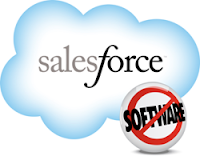 Can we set Salesforce user password? As Salesforce administrator, we often get question from our user, "can you check what is my password? " hmmmm, some users often think like some legacy applications, where system admin able to see or modify Salesforce password. In Salesforce is different, it is so secure, system admin and everyone else not able to see or modify any user password. But, as the best practice, we offer to reset their password, and Salesforce will send email to the user with instruction to set new password by their own, and it should works fine. But again, some users (read: senior management) not really want to bother by checking email and so on, even the request is come from his/her secretary. So how? No problem, we can change user email to her secretary email, secretary confirm email change in her email (although Salesforce also will email to the original email say that the email has been changed to new one), and reset password. It works, yay!!! But, how to change back the user email to the original one? The senior management need to click a link again in her email (she may have hundreds or thousands email never read). Problem. So, I just start think if there is an easy way to set user password without have to go through such complicated process? It is worst when the user is going to present something in 5 minutes and we do not have much time to do above process. So, can we set user password? YES, it is possible, this function is not exist in Salesforce setup menu, but Salesforce is kind enough to provide system administrator with Developer Console. Yes, Developer Console is for developer as it named, but admin also can use it for other purpose, like set user password, yay!!! In this sample: 00550000000rlrX is the User Id, if you are Salesforce admin, you should now this Id well, and hello123 is the new password to set. You can modify the SOQL above as needed, example: only for profile = "Sales Rep". All statements above is apex code, but we can utilize it for other productive work as needed. 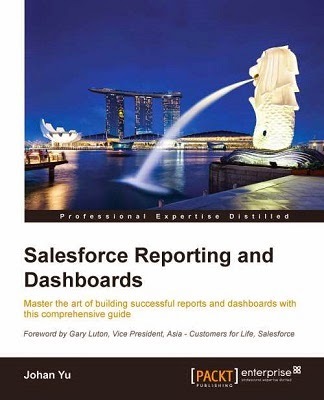 Can we publish image from Salesforce.com ? Kita dapat mem-publish suatu image untuk di-share ke internet untuk dapat di akses secara public, dari menggunakan menggunakan Flickr atau Photobucket dan lain sebagai nya. Tetapi sebagai pengguna Salesforce.com, apakah kita bisa mem-publish image yang ada di Salesforce.com? Untuk meng-akses image dari suatu attachment yang tagged ke suatu object, dibutuhkan login ke instance Salesforce.com yang dapat meng-akses attachment tersebut. Jadi attachment bukan merupakan option untuk kebutuhan ini. Diperlukan Visualforce page untuk meng-akses image yang ada di Static Resource. Jadi kita harus membuat Visualforce page untuk mengakses image yang ada di Static Resource, dari menu Setup - App Setup - Develop - Pages dan click button New. Jadi, menyimpan gambar pada static resource dapat di akses oleh public, tetapi ini bukan cara yang simple dan membutuhkan bantuan Force.com Site. Anda dapat meng-upload gambar sebagai document di Salesforce.com dari dropdown Create New... atau dari tab Document (tergantung dari konfigurasi Salesforce.com Anda). Pastikan option Externally Available Image pada document yang mau di share diaktifkan. Ganti nama instance (dalam hal ini penulis menggunakan "my domain" johanmilis2-developer-edition--c.ap1) dengan instance Salesforce.com Anda, misal nya: na1, na2, na6, eu0, dll. Ganti nilai pada parameter id dengan Document Id yang mau di publish, biasanya di mulai dengan 015. Dan ganti nilai pada parameter oid dengan Organization Id Anda, biasanya di mulai dengan 00D. Anda dapat menggunakan image type JPG, GIF, PNG untuk kebutuhan ini. 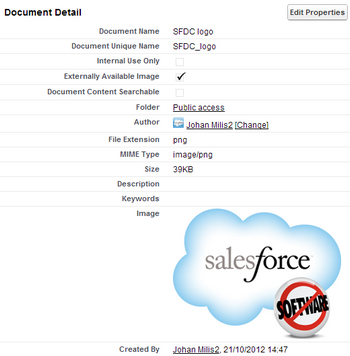 Jadi Document merupakan pilihan untuk share image yang di ada di Salesforce.com ke public dengan simple.